The beautiful Ittiwan Oak is located in Great Oak Park in Daniel Island Park. 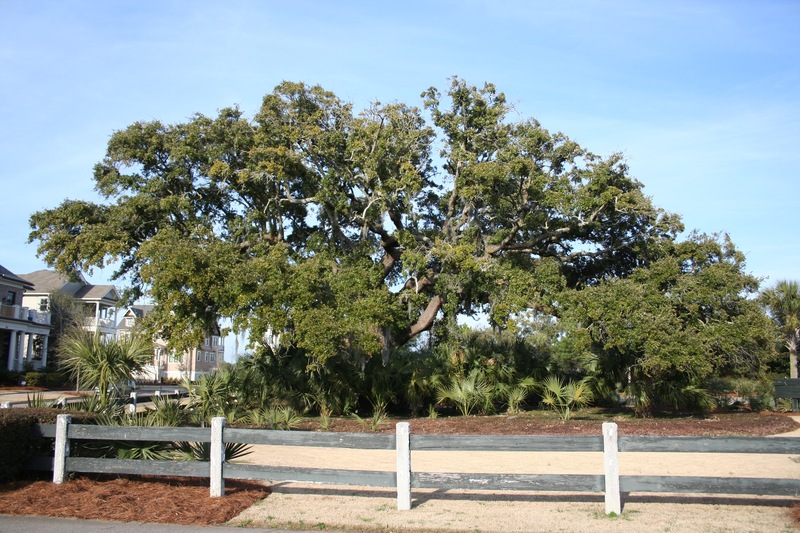 In 2015, this majestic oak was named the South Carolina Heritage Tree! Click on the link below to read more about this honor and its significance to our community. The following article was written by DIHS Board Member and Co-Founder Michael Dahlman and published in the Daniel Island News on November 9, 2011. Native American Indians have lived on Daniel Island for at least 4,000 years. Archeologists from Brockington and Associates, a cultural resource consulting company who has been working on the Island for the past 17 years, have recovered Native American clay pottery pieces from dozens of sites they have investigated. Many of these artifacts date to a period called the Ceramic Late Archaic Era, which covers the timeframe of 2500 to 1000 BC. Native Americans did not live along the coast year round until the 16th century, and most of the sites identified are consistent with limited occupation. In the fall and throughout the winter, the tribes moved inland, returning to the coast in the spring. The sites are close to the rivers that surround Daniel Island, or along creeks and marsh that would allow access by small canoe. The first written record of the Etiwan occurs in the reports of Spanish Captain Francisco Fernandes de Ecija who sailed from St. Augustine Florida and entered Cayagua (pronounced Kiawah) or today’s Charleston Harbor in August 1605 and again in August 1609. Both reports make careful note of the names of the tribes in the area which included the Cayagua, Xoye (Sewee), Sati (Santee) Oriesta (Edisto), Ostano (Stono) and the Ypaguano (Etiwan). While at anchor in 1609, an Etiwan Indian who had claimed to have visited the English settlement in Virginia and seen “many people, one fort” was taken prisoner and interrogated at length. The earliest English reports referred to the occupants of present day Daniel Island as Ituan (1670), Ittiwan (1671) Etttowan (1672) and described them as living on the island at the junction of the Wando and Ittiwan (the present day Cooper) Rivers, and north along the Ittiwan River. In 2002, a major Native American site was discovered on the west bank of Ralston Creek. Extensive archeological work by Brockington and Associates in 2003 determined this to be the location of significant seventeenth century Indian activity, including, hearth sites, trash pits, four dwellings and one burial site. Presumably, these features reflect the Etiwan Indian occupation of Daniel Island. Artifacts were recovered from the Ceramic Late Archaic Era up to and including evidence of occupation through 1670. Investigative work continues on the material recovered from this site that is proving to be one of the best preserved and most carefully investigated Native American sites on the southeast coast. The first named reference to Daniel Island occurred in a 1676 grant to William Jones where it was called Ittiwan Island. This name was used consistently for the next 30 years, although at times it was known as Thomas Island in deed abstracts due to confusion with ownership on the adjacent Thomas Island. Starting in 1706, the use of Daniell’s Island became standard and referred to Lieutenant Governor Robert Daniell, who owned most of the island in the early 1700’s. Over time, this was shortened to today’s Daniel Island. The Etiwan Indians were steadfast supporters of the newly arrived English settlers. They were counted amoung the tribes that pledged support to defend them against the Spanish and their Indian allies, who landed on Kiawah Island near the mouth of the Stono River in August of 1670, just months after the English landing at Albemarle Point. The Sewee and Etiwan were also mentioned frequently as early traders of deerskin and providers of maize, fish and venison during the critical first few years of the colony. The Etiwan were also among the 100 or so free Indians that fought with the English in the 1715 Yemassee War. In 1675, the Etiwan, Sampa, Sewee and Wando tribes approached Maurice Mathews and asked to be relocated to a “town in some convenient place not injuring the English settlements.” Mathews, at the direction of the Grand Council, established an area for the Native Americans who lived in the vicinity of the harbor. Land on both sides of the Wando, more than three miles north of the mouth of the Wando “… was allowed for our Neighbor Indians, for we thought it not Justice though with our own consent and with a valuable consideration paid them too, to remove them from their old habitations without providing for and securing to them a place where they might plant and live comfortably, or that any of their former conveniences of life should be taken from them in the vicinity of present day Goose Creek.” (Mathews, A Contemporary View of Carolina in 1680, spelling variations corrected from original source). The Wando and Sewee settled to the south of the Wando, the Sampa and Etiwan to the north. The Etiwan also established a large presence in areas near present day Goose Creek. A great deal is known about the Etiwan Indian tribe after their relocation to Goose Creek. Francis Le Jau, the first Rector of the Church of England of the Parish of St James Goose Creek wrote a series of letters which span a period from 1706 through May 1717. A census taken in 1715 found one village with a total population of 240 Etiwan. Today, in the Carnes Crossroads area just north of Goose Creek, descendants of the Etiwan, Edisto, Sewee, Santee, and other coastal tribes have lived for hundreds of years in relative obscurity. Before desegregation, five schools served the children of Varner Town Community from the 1880s until 1963. Greater recognition occurred in 2007 with the establishment of an historical marker at near Carnes Crossroads. Today, the Varner Town Indian Community Economic, Health and Cultural Development Council is continuing to advance the awareness of Native Americans and look after their economic and social needs.